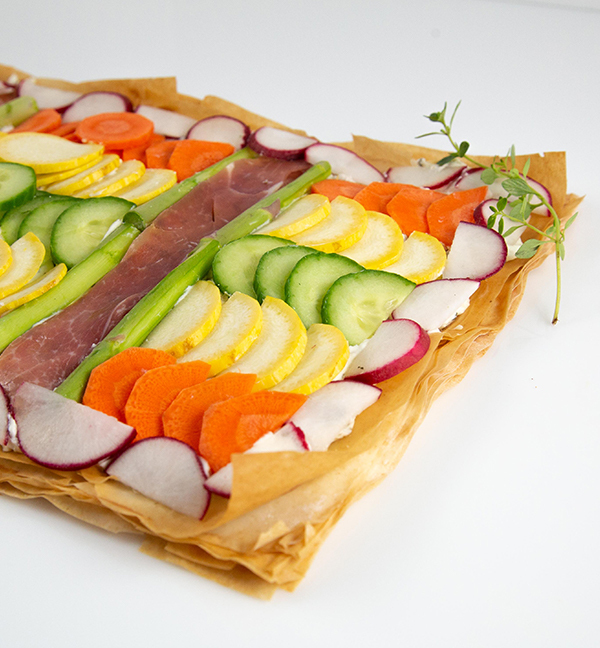 Unleash your creativity with this tasty, crunchy phyllo vegetable tart. Slice, then layer your favorite veggies however you’d like onto a base of phyllo and chive cream cheese. Thaw one roll of phyllo, following thawing instructions on package. Preheat oven to 350°F. In a small bowl, whisk together egg white, 2 tablespoons olive oil and water. Place one sheet of phyllo on baking sheet. Lightly brush with egg mixture and sprinkle with some thyme. Place a second sheet on top, brush with egg mixture and sprinkle with thyme. Continue procedure with remaining 8 sheets but brush the top layer with olive oil instead of egg mixture. Bake for 15-20 minutes or until golden brown. Prepare vegetables while phyllo is baking. Using a mandolin or a thin sharp knife, slice cucumber, carrot, radishes and summer squash into thin circles. Cut each slice in half to form semicircles. Slice asparagus into thirds and then cut each piece in half lengthwise. Slice or fold prosciutto into strips. When phyllo is cool, gently spread evenly with whipped cream cheese, leaving a ½” – ¾” border. Gently press vegetables and prosciutto into the cream cheese as shown or create your own beautiful design. Slice and serve. • Any vegetables, herbs and cooked meats may be substituted. The key is to slice them very thin. Searing is believing when it comes to this new spin on sushi. 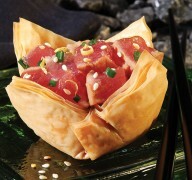 Lightly cooked tuna combines with our irresistible phyllo dough for the perfect date-night recipe. 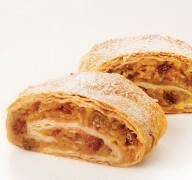 With a filling that blends brandy-soaked raisins and Granny Smith apples with chopped walnuts and apricot preserves, these flaky-crusted strudels will lend a sweet and refined finale to your next dinner gathering.